The Harlequin Rasbora, a fascinating little fish, belongs to the family Cyprinidae. It comes from the Malay Peninsula, Thailand, and Sumatra. This, the most common and easy to keep member of the Rasbora family, was first imported into Europe in 1906, making its way to the rest of the world’s aquariums very soon after. Harlequin rasbora habitats are rivers and streams of the Malay Archipelago, Thailand, Kuala Lumpur, Selangor, Singapore, Borneo, and Sumatra. The fish was first brought to Europe from Singapore in 1907. In the wild, they prefer peat swamps and gently flowing areas of forest streams and tributaries where vegetation is thick. Light in these areas is filtered by leaves and tends to be fairly dim. The water in the Harlequin Rasbora’s natural setting is extremely soft and its temperature often rises quite high during the day, while dropping much lower at night. Nowadays, most of these colorful little fish have been raised on Florida tropical fish farms and in aquariums so their natural need for very soft water has been somewhat abated. The appearance of the Harlequin Rasbora, with a dark triangular patch extending back from the base of the caudal fin, is very distinctive. The silvery tone of the rest of the body may be broken with yellow or reddish markings, which has resulted in this species also becoming known as the Red Razor. Males tend to be brighter in color than females and have slimmer bodies. The female has a rounder lower profile and at breeding time become quite plump. Shoal fish should always be kept in odd numbers of 3-5-7 or more because this ensures that there will be odd numbers of males and females. This encourages competition and interest among the shoal, keeping them together, rather than pairing them off in different areas of the aquarium. In nature, the Harlequin Rasbora does not usually tolerate contact with fish of other species, so if they are to be kept in a community tank, they should be kept in odd numbers of 5-7 or more, and given plenty of places to hide. Choose small, peaceful tankmates that are unlikely to annoy or attack them. In a peaceful tank, your Harlequin Rasboras will be happy community members, and never bother any other fish in the tank. Your goal, in setting up your tank, will be to recreate the Harlequin Rasbora's native habitat. As it prefers slow-moving, highly vegetated, peaty waterways, you'll want to start with a dark sandy or gravely substrate and add some leafy detritus. Add plenty of live plants, rocks, and driftwood to your tank. Do be sure, however, to keep the plants toward the back and sides of the tank to leave room for an active shoal of fish. Keep lights relatively dim, and consider adding some floating vegetation to the tank. This fish, if in a well-planted aquarium with other docile community fish, has been known to actually breed and raise their young with little or no assistance from the aquarist. This is indeed a fun fish to breed and very willing to give a beginner very satisfying results. Rasboras are not picky eaters; they will enjoy a varied diet of high-quality flakes or granules and live foods such as daphnia and artemia. You can supplement this diet with meaty options such as freeze-dried bloodworms or tubifex worms. Rasbora will also enjoy an occasional treat of fresh vegetables. Male and female are roughly the same size, but the sexes are easily distinguished. Males are much redder in the dorsal and tail fins, also in the caudal peduncle region. The female is more golden, and when full of roe her belly is deeper than that of her mate. Since the advent of air travel, Harlequin Rasbora’s have been imported by the tens of thousands from their native Malaya. They are shipped 500 to a 1 foot by 1 foot by 1 foot boxed plastic bag filled with pure oxygen and 1 ½ gallons of their natural water. Few die and so they are always in demand. In spite of the constant demand, the source of supply in their natural home is never depleted. They literally swarm in great numbers in pools in Malaya, then all are caught in a net, the pool fills again in what seems like weeks. Bottom line, this is a hardy fish that loves to breed, and even a beginner can be successful. Set up a separate breeding tank that includes broad-leafed Cryptocoryne plants as the Cryptocoryne is this species' favorite location for egg laying in their natural environment. First, place a well-conditioned adult male with a younger heavy with roe female in the breeding tank late in the day. Courtship should probably begin early the next morning and is instigated by the male and includes the usual fin-flaring and dancing in front of his mate. The pair starts swimming around the tank together and eventually moves under a suitable broad leaf of a plant. Here they turn upside down and deposit a few eggs. Then they move off and court some more before coming back to spawn again, which will probably take place on the same plant, or even the same leaf. When a healthy pair is finished they will have deposited 25-100 eggs. 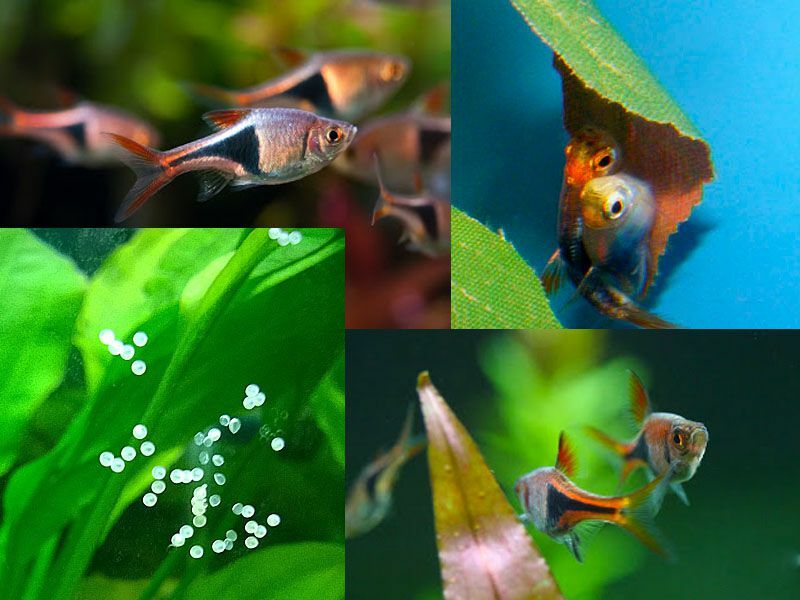 The Harlequin Rasbora is not an avid egg eater, but they will eat some of the eggs occasionally; it's, therefore, a good idea to remove the parents as soon as breeding is concluded. The fry hatch in about 24 hours and the fry are free swimming on the third day. At this point, they should be fed infusoria or liquid fry food or an egg yolk squeezed through a cheesecloth for the first week. Then wean them slowly onto baby brine shrimp and commercial dry ground fry food. They grow extremely fast and are a pretty good size within three months if fed well and often. Add a sponge filter after the first week, and change 10% of the water every week after the first month.